The result was amazing. Bursting with flavour and the most gorgeous texture, I was blown away with how good these were. 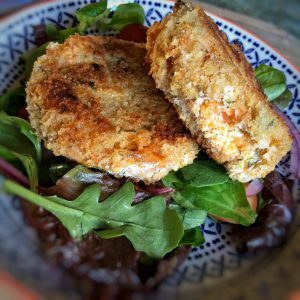 When made with sweet potato these fishcakes are 3sp each however if you would like to make them with Butternut Squash, they would be 2sp each. 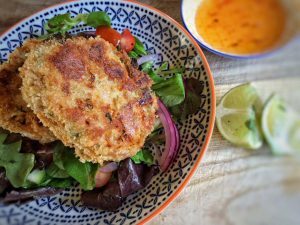 I served two fishcakes per person with a lovely light salad of mixed leaves, courgette strips, tomatoes, red onion and lemon juice, a little bowl of sweet chilli sauce (2 tsp per person is 1sp per person) and a slice of lime. Delightful! These would be a great meal to make for those of you who have kids, just be sure to omit the chilli from the fishcake mixture!! 2 tsp of sweet chilli sauce per person (optional – add 1sp extra per person). Preheat the oven to 200c and pop in a small baking tray to warm up. Take a saucepan, half fill with boiling water and add a little salt. Add the sweet potato and then boil for 10 minutes until nice and soft. Drain the potatoes and then mash until smooth (I used a potato ricer to achieve a lovely none lumpy finish). Drain the salmon and then add to the potato with the spring onions, chilli, garlic, ginger, lime and coriander and combine everything together. Season to taste. Split the mixture into four and then take each 1/2 in turn and shape into a fishcake. Pop onto a plate to one side. Take three bowls. In one add the seasoned flour, in another the panko (or normal) breadcrumbs) and in the other the egg. Then taking each fishcake in turn, coat in a light dusting of flour, then egg and then breadcrumbs. Pop on the baking tray and repeat for the rest of the fishcakes. Spray the fishcakes with 1kal and pop in the oven for 20-30 minutes (until a nice golden brown). If the fishcakes aren’t browning how you would like, take them out the oven after 20 minutes and finish off in a frying pan with 1 tsp olive oil. This will give you the golden brown finish you are after. Serve on top of a light salad (mixed leaves, courgette strips, tomatoes, red onion and lemon juice tossed together) with a little bowl of sweet chilli sauce (2 tsp per person is 1sp per person) and a slice of lime. So glad you liked it Gemma! going to give this a go tonight! do you know how many calories ? Your website has made me want to cook again ! Hi Rachel, I shouldn’t see why not. I would make the fishcakes, dust in flour and then wrap in clingfilm and freeze. Then when you defrost them complete the egg and breadcrumb steps. This will avoid the breadcrumbs going mushy when they defrost. Well I’ve made many of your recipes several times. This again was yummy. I tell my friends about ur website & when people on WW connect ask for meal ideas I always add your website. Keep it up. U have a real talent & due to u my family are eating better &healthier. Hi Lucy, I love fresh salmon but tinned is better for this as it’s a little less moist and binds very well with the other ingredients. I would keep fresh salmon for something where you didn’t have to mush it up as much! 🙂 hope you like them! Hi Laura…I’ve made this recipe before and it is absolutely delicious! I’ve just been to the cupboard and I don’t seem to have enough salmon! Do you think I could use a tin of tuna in the mix?